A CDN service caches origin content (left part of the scheme) in our CDN network and creates a fast CDN content (right part of the scheme). For CDN Static and CDN Video services there are two possible origins - you host your origin content on your server (Origin Domain) or you host your origin content with CDNsun (Origin Storage). For CDN Live services there are two possible origins - you use your streaming server (Origin URL) as Pull publishing point or you use CDNsun streaming server (Origin PoP) as Push publishing point. 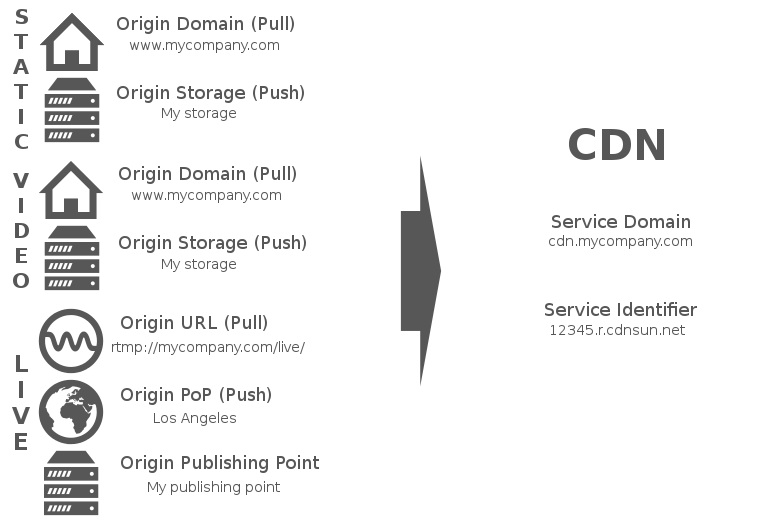 For CDN HTTP Live services there is one possible origin - Origin Publishing Point. Please refer to Overview of CDN services for more details. Origin Domain - www.mycompany.com, img.mycompany.com, 1.2.3.4, etc. (not www.mycompany.com/images and not http://www.mycompany.com), domain or IP address of your own. Origin Storage - My Storage (Storage label), My Storage 2, etc. Origin PoP - Los Angeles (PoP label), New York, etc. Origin Publishing Point - My Publishing Point (Publishing Point label), My Publishing Point 2, etc. Service Domain - is a name/label of a CDN service in our system and also defines a customized (your) domain (e.g. cdn.mycompany.com) for accessing CDN content. Service Identifier - is an "ID" of a CDN service in our system and it also defines a CDNsun domain (e.g. 81775437.r.cdnsun.net) for accessing CDN content. Service Domain and Service Identifier are CDN opposites to Origin - they both determine where (via what domain) you can access your CDN content. Every CDN service can be accessed via both its Service Domain and its Service Identifier. Service Domain - can be (must be) set when you create a new CDN service, is editable. Service Identifier - can't be set when you create a new CDN service, is not editable. Service Domain - cdn.mycompany.com, static.mycompany.com, video.mycompany.com, etc, a domain of your own. Service Identifier - 81775437.r.cdnsun.net, 93562897.r.cdnsun.net, etc. Both Service Domain and Service Identifier must be unique. So for example you can't create two CDN services with the same Service Domain.